Leroy Brown is a mainstay in the reggae music scene and a key figure in the development of the genre in Canada and keeping it vibrant and alive. He is an accomplished bass player, guitarist, songwriter, producer and singer. He came to Canada in 1971 from the musical bastion of West Kingston, Jamaica and is most likely the man responsible for introducing many Canadians to Reggae Music. Leroy works closely with the legendary production duo of Sly & Robbie and Canadian producer John Forbes producing various artists not just for Reggae but also in all music genres. Leroy’s highly acclaimed solo project Color Barrier is heralded as one of the genres’ “must have” recordings. Leroy has be the recipient of many awards including: The JUNO AWARDS, The Black Music Awards, The Canadian Reggae Music Awards and The Bob Marley Memorial Award. His current single is a Reggae version of “You Raise Me Up” which was penned by Brenden Graham and a huge hit for Josh Groban. It is certain to become a Reggae Music mainstay. A video has been produced to support Leroy’s soulful reggae rendition of this iconic song. When he came to Canada in 1971, there was virtually no reggae music scene. But with determination and a passion for Reggae music, Leroy along with the many eclectic Jamaican artists living in Toronto at the time developed a Reggae music scene, which virtually snuck up on the city and grew to be a major music force crossing over into the main stream. Leroy is a primary contributor to a CD project entitled “Victory”, which features many artists that he has worked with throughout the years including Sly & Robbie, Glen Washington, John Forbes, Stranjah Cole, Leroy Gibbon and others. The CD is being aligned with a campaign for “Victory over Violence” in support of various scholarship funds in the names of victims who have succumbed to gun violence. In Toronto, the scholarship fund will be administered by The Tropicana Organization. The campaign, which is an international project, will be aligned with other community organizations around the world. Leroy Brown is a mainstay in the Reggae Music scene. An accomplished bass player, guitarist, songwriter and producer hailing from the musical bastion of West Kingston, Jamaica, Leroy has made Canada his home since 1971. He is most likely the man responsible for introducing many Canadians to the musical style of his heritage and keeping the Reggae music scene vibrant and alive in Canada. A charismatic and personable stage performer he continually attracts audience wherever he performs. He has a very busy production and concert schedule promoting various solo projects and developing artists who he is producing. Current Activities Leroy Brown is currently working with the legendary production duo of Sly & Robbie and Canadian producer John Forbes producing various artists not just for Reggae but in all musical genres. 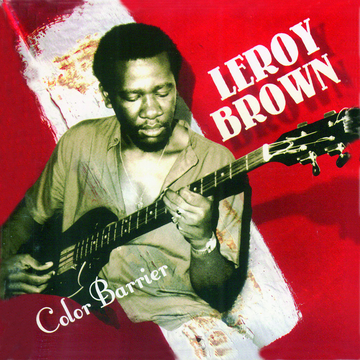 Leroy’s latest solo project Color Barrier has been released in Europe through notable Reggae label MAKKASOUND based in Paris, France. Leroy is a primary contributor to a CD project entitle “Victory”, which features many artists that he has worked with throughout the years including Sly & Robbie, Glen Washington, John Forbes, Stranjah Cole, Leroy Gibbon and others. The CD is being aligned with a campaign for “Victory over Violence” in support of various scholarship funds in the names of victims who have succumbed to gun violence. In Toronto, the scholarship fund will be administered by The Tropicana Organization. The campaign, which is an international project, will be aligned with other community organizations around the world. Leroy has entered into a publishing and distribution agreement with Backstage Productions International, which will see his substantial collection of masters reissued, with an emphasis on digital distribution, making his music available world-wide through The Orchard, a leading player in the digital distribution arena. His music is also being placed in films and television programs through Star Satellite Music Publishing. Past Success 2004 JUNO Award Winner for the song “RENT-A TILE” composed by Leroy Brown and produced by Sly and Robbie. Recipient of many awards including: the Black Music Award, Canadian Reggae Music Awards and The Bob Marley Memorial Award. Leroy has the distinction of being discovered by Alton Ellis, one of Reggae Music’s founding icons; He went on to record for producer Sonia Pottinger on the High Note Label in the late sixties. He was the lead singer for the Hippy Boys’ Band which included Family Man and his brother Carlton Barrett who later joined Bob Marley and the Wailers. He was also the lead singer for the Emotions. 2003 – CARAS nomination for another JUNO Award for the hit song, “Heartache”, released on Big People Music Volume 9 distributed through Jet Star UK. 1997 – CARAS Nomination for a JUNO Award for the album was “Nice And Slow”. The Canadian Reggae Music Awards (CRMA) has recognized Leroy “Artist” Brown’s contribution to the reggae industry in Canada and across the world. 1990 CRMA Award for top performer also winning top single of the year for “I’ll Be Lonely”. 1984 received his first CRMA for “Island In The Stream” which he sang with Nana Mclean.